Mrs Taylor's new bike is a Scott Sportster 10 Solution hybrid bicycle, 2011 model. The month of August seems a good time to buy current year's models as retailers sometimes reduce their prices to make room for next year's. It was supplied by a local bike shop and supposed to be a surprise. But the ruse failed. She's pleased with it anyway. It has a more upright riding position than her touring bike and she finds it easier to breathe properly going up hills. The front suspension and easy to squeeze hydraulic disc brakes are altogether better for her wrists, both of which she's broken in recent years, and a shoulder – all plated. My own Giant hybrid bike (bought last August) has worked out well so the whole thing seems to make sense. The first bike Sandra owned, and has ridden a lot, is still in the garage: a mid-1980s Peugeot all-terrain – that was a surprise as well. So I was confident this new one would not be rejected. The Scott Sportster Solution is supposedly a bike made for women. It has a lower stand-over, shorter stem, and slightly wider saddle than the plain Sportster – the man's version. It does look like a 'ladies' bike. The decal graphics are superb. Does my less fancy Giant look like a man's bike? Who knows? Women on cycling forums sometimes complain how they can't find female specific bicycles. Well this is one. I like the 'chainguard' – actually a chainring protector. More bikes should be fitted with these in my opinion (for safety). 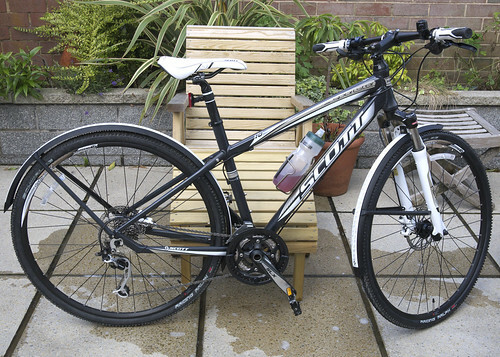 Scott hybrid-specific mudguards were extra, and expensive, but worthwhile. They look the part and are very strong. Scott also supply a rack that actually sits on the rear one. All in all it's a lovely bike. Now the question is, where to store it? It brings the household up to eleven bikes. Posted by Patrick on August 27th, 2011. That is a really comfortable looking bike Patrick, Im sure Sandra is going to love riding this. Does it have brazons for a rear rack? I am all for those chain ring protectors too, I have one on my Amazon tourer. I always end up with a 'chain tattoo' on my legs where the oil from the ring imprints me when I have to lift or shift the bike about. The number of pairs of trousers I own with the same 'tattoo' on them as well! I prefer that straight bar system on a bicycle. Which is why I have my drops 'tipped' up as far as they can go so I too get that nice upright position when cycling along. Disc brakes are a great invention too, and not affected by the rain. Looking forward to reading about Sandras next adventure! There are two sets of braze-ons at the back, so a rack could be fitted Mary – and might be, if Sandra uses this bike for France in October (the next adventure). The rear brake is positioned inside the rear triangle so it won't need a special one. On my Giant the brake is above the chain stay so I'd need a 'disc brake' type rack. I'm still dithering over it, as they are a bit pricey. A slight niggle with the Scott Sportster handlebars is that they are swept back a few degrees immediately from the stem, and tapered – they are oversize at the stem itself – so unless I'm missing something there's nowhere to fit a front light without it pointing sideways. The light clamp won't expand enough to fit round the short length of oversize bar that is actually at rightangles to the stem. This seems a silly idea – oversize bars that taper from the stem. You'd struggle to fit a bar bag too. The seat post is also oversize but the rear light clamp expands enough to fit round it. On the plus side, there's no cable guide under the bottom bracket because the cable routing doesn't require one. The under-BB cable guide system has always seemed a weak spot to me – extra friction and wear on the exposed cables. That certainly looks like a 'go anywhere' bike. I see that it has 700c wheels but other than that what is the difference between that and a hard tail MTB? A similar quality hard tail MTB will be a little heavier I think Hilary. MTBs tend to have lower gearing, a longer travel fork (100+ mm) and down tube lifted for more frame clearance, wider rims and tyres, bigger brake rotors, and probably no way to attach normal mudguards or pannier rack. So there are differences. I know what you mean though. The bigger wheels are available on 29-er MTBs nowadays. Ah yes, I see, thanks for that. FINALLY, I understand what the numbers mean! ONe good thing about the chain set on the Hetchins getting trashed due to over use and under maintenance, is that I finally understand how the ratios work on the chainrings at the front and the cassette or block at the back. We have our very own gear inch calculator on this website Mary. You can feed in your chainring and sprocket teeth and find out how fast you'd go in each gear at a particular cadence. Or how many 'gear inches' etc. After playing with it recently I moved the bottom bracket on 2 of my bikes. 5ft 7in and medium bike. You'd probably want small for your wife but I'd check with the supplier what height the small size is for. I think I phoned Evans Cycles to ask their opinion. Probably doable. Google for "suspension fork pannier rack" shows some examples.